You are invited to our hotel Saski in the center of Krakow! We offer suites and rooms for one, two or three persons. We will do our best to make your stay pleasant and relaxing. You will be staying in a hotel with two hundred years tradition. 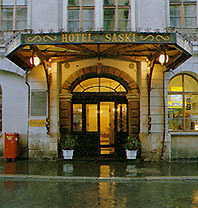 The hotel Saski is situated in a sixteenth-century townhouse close to the Main Market Place. We wish you a pleasant stay in Krakow. Prices in PLN can change.